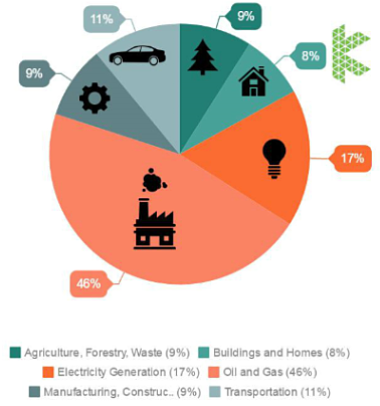 Alberta's emissions by Fuel Type, and Sector and Solar energy's role in Alberta. Are Alberta’s emissions going down? What percentage of Alberta’s emissions come from energy? How much of Alberta’s energy comes from renewable sources like wind and solar energy? These seemingly simple questions are widely unknown to many Albertans. Which is why we decided to answer them and more in this post – with lots of data and figures to back it up. Alberta’s energy market today is dominated by fossil fuels, namely, coal and natural gas. Both of these fuels are highly carbon intensive meaning they generate a lot of carbon dioxide relative to fuels like the sun, wind and water. In order to compare fuels to one another fairly in terms of C02 generation, we will examine the mass of C02 output per unit of energy generation (t C02/GWh). This is called the emission intensity. First let’s examine where Alberta’s carbon emissions. In 2013, Alberta emitted 267Mt (1Mt = 1,000,000t = 1,000,000,000kg) of C02 eq. C02 equivalent is the converted unit used to represent all greenhouse gases which also include methane (CH4), nitrous oxide (N20), ozone (O3) and other chlorofluorocarbons (CFCs). It would be a major hassle to have to type out every greenhouse gas’ output so all values are typically given in C02 equivalents. If you read C02 during this post, assume it is C02 eq. The good news – measures are being implemented to reduce C02 emissions across multiple sectors! The bad news – they might not be enough given our current economic situation (which isn’t the best right now). …I wish that last quote was not taken directly from the Government of Alberta website, but unfortunately that’s the reality we are facing right now. So let’s take a look at how we are producing these emissions. And I say “we” here intentionally as every Albertan is responsible for its share of emissions. The oil and gas sector should not bear 100% of the blame, nor the housing nor any of the other industries. But rather, every industry, every sector, and every individual must do their job in reducing emissions. It is safe to say that all industries, individuals, communities and governments will need to work together if we are to tackle this monumental task of climate change. The energy sector plays a major role in Alberta’s emission profile. In 2013, energy generation accounted for 17% of all carbon emissions in the province. 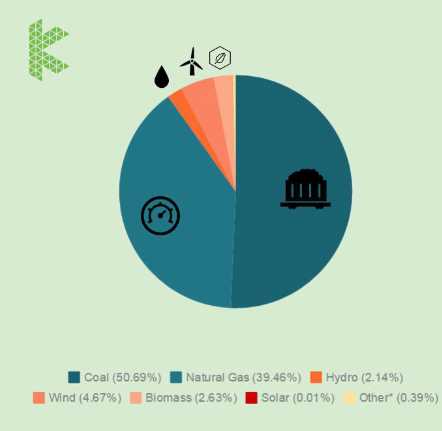 Other emissions are broken down as follows: Oil and Gas – 46%, Manufacturing and Construction – 9%, Transportation – 11%, Forestry and Agriculture – 9%, and Buildings and Homes – 8%. Obviously the elephant in the room is 46% of Alberta’s carbon emissions coming from the oil and gas sector. 46% of 267Mt (2013) is 123,000,000,000kg of C02 eq. coming from the oil and gas sector every year. What’s worse is that it is expected to steadily rise until 2030. Oil sands operations are responsible for “roughly 70 Megatonnes” of C02eq per year according to the Alberta Government (the 53Mt difference between the 123Mt cited earlier is likely due to gas extraction and refining processes). The cap on emissions of 100Mt allows for oil sands emissions to rise by 43% until 2030, which does not include the downstream emissions either. Such a situation is unfortunate, but once again is just a reality we must deal with, learn from and improve. As a solar energy contractor, our primary focus is reducing the 17% of emissions from energy generation. Surely, the installation of solar panels must be making some headway in the energy market, right? In 2015, 51% of Alberta’s energy came from coal, and another 39% came from natural gas. That’s 90% of Alberta’s energy that comes from fossil fuels - easily the highest in the country. This is certainly not to say that renewable energy doesn’t work or that we should give up - quite the opposite. Renewable energy has seen tremendous growth in the past 5 to 10 years. Wind energy in Alberta has increased by over 18%/yr for the last 5 years according to the AUC. Solar power generating capacity has an even more impressive growth trend. 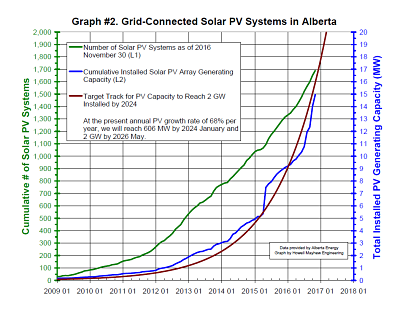 Although solar energy generation is miniscule on the grand scale of Alberta’s complete energy profile (for now), solace can be taken in the inspiring growth trend of the Alberta solar industry. Since 2008, solar power generating capacity in Alberta has grown by 95%/year according to meticulously logged data (which is a vast understatement if you have ever seen his spreadsheets) from Gordon Howell of Howell-Mayhew Engineering. Yes, you read that right – solar power capacity has grown by 95% per year since 2008. The graph shown above, also compiled by Gordon Howell – shows the exponential increase in solar PV systems since 2009. The graph is current as of November 30, 2016 and is updated monthly if you are a data nerd like some of us solar people. If this growth trend is to continue, further measure must be taken to ensure more solar power is implemented throughout Alberta. Although solar energy only represents a tiny fraction (0.01% to be exact) of Alberta’s energy profile, there is an abundance of hope surrounding the future of the solar energy and renewable energy industry. As demand grows, the price point will continue to decrease and the efficiency will continue to increase, creating not just competitive products, but ones that are the clear cut choice. More solar panels means more jobs, more money for the economy and fewer carbon emissions. If only everyone thought the same way. This is correct only in that individual solar panels are 16-20% efficient. However, the energy generation potential, long-term levelized cost and incredible environmental benefits override the efficiency of 1 single solar module. The average Alberta home uses 6,861kWh/yr according to the 2015 AUC energy statistics. This can easily be met by just 20-24 solar panels. The average Alberta home can become electrically net zero with the installation of 20-24 solar panels. Not to mention that given current electricity price increases and market trends, a solar energy system will pay for itself in just 15-20 years resulting in tens of thousands of dollars saved over a 30 year period. AND that a system of this size will pay off its own carbon in about 2 years and offset over 100,000t of carbon in its lifetime. But I guess solar power just isn’t there yet? This one is a very common challenge to the benefits of solar power. Solar energy works just fine throughout the year, here is why: Solar energy generation is calculated on an annual basis and most of Alberta’s sunlight comes in March to September. Since your energy retailer monitors your generation vs consumption, you develop a rolling credit during the summer months when you might be producing more solar energy than you consume. 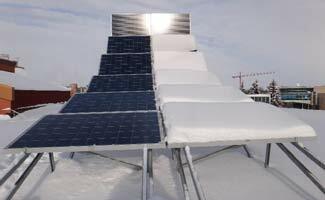 According to NAIT’s Reference Array Report, solar panels which are free of snow will only produce 1-5% more, on an annual basis, than those that are covered with snow throughout winter. This is predominantly due to most of our annual sunlight (solar irradiance) coming in the spring, summer and fall months when solar panels aren’t covered with snow. Those are just two of the main points that ill-informed critics of solar power usually cite. There are plenty more, but I won’t get into them all in this post. Long story short, solar energy represents a small portion of the current energy industry, but its growing at an unprecedented rate. But are solar panels that much more environmentally friendly than fossil fuels? One simple and effective way to compare fuels is to look at their carbon emission intensity (t C02/GWh). The graph above, compiled by the World Nuclear Association, shows the emission intensity of various fuels. The data was taken from 20 different studies from both sides of the political/energy spectrum and averaged out to the values shown above. Lignite, which is a low-grade coal, is the worst emitter at 1054t of C02eq/GWh. Conventional coal, which is what we burn here in Alberta is a heavy emitter of C02 emits approximately 888 tC02/GWh. Natural Gas, Alberta’s second favourite fuel source, emits ~499 tC02/GWh. Solar PV, shown by the bright orange bar, only emits 85 tC02/GWh. After crunching these numbers, solar energy emits 10x less carbon emissions than coal and 5x less carbon emissions than natural gas for the same amount of energy generation! Biomass, Nuclear, Hydro, and Wind are even better than solar energy in terms of carbon emission intensity, each generating 45, 29, 26 and 26 tC02/GWh respectively. This is a telltale sign that solar energy, wind energy and all renewable energy sources are a viable means of reducing our carbon emissions. The fuel intensity graph illustrates nicely how cutting coal fired electricity is one of the easiest ways to reduce our carbon emissions. Ending the use of coal fired electricity is the “low-lying fruit” of the carbon emission reduction battle. It is a simple concept, no? Let start with the good news – Canada’s carbon emissions decreased by 2.0% from 2005 to 2014. That’s an OK start, but emissions have started to increase again in recent years. Even still, it is nowhere near enough to meet the PC’s goal of 17% reduction from 2005 levels by 2020 as illustrated by the chart below. I wish I could tell you that I made this chart and there must be errors in it, but we are not so lucky. This chart is from Environment and Climate Change Canada and is correct unfortunately. In my short lifetime I am yet to see a single chart which instills optimism based on current/past environmental performance with the exception of Gordon Howell’s solar power capacity growth charts. This shouldn’t get you down, but rather should open you up to the huge economic and environmental opportunity that awaits before us. 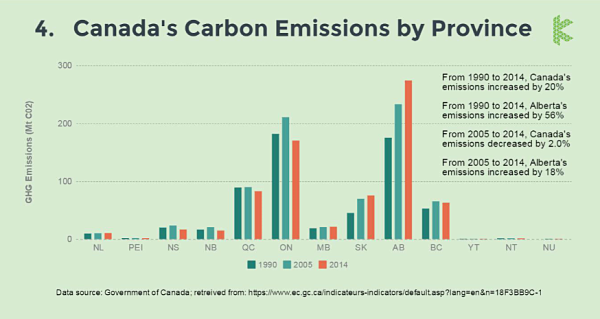 Although Canada’s emission control measures have been somewhat (which is a stretch) in check as of late, it is in no part thanks to Alberta. Alberta’s emissions have increased by 56% since 1990, and 18% since 2005. The elephant in the room this time is Alberta’s looming tower of unabated emissions. Alberta leads the nation in GHG emissions with 267Mt in 2013. Alberta accounts for 37% of all the GHG emissions in Canada (2014), but only 10% of the population and 19% of the GDP for the same time period (data from Statistics Canada). We are emitting more than we need on a per capita and per GDP basis. With the extremely low price of oil, this disparity in emissions/GDP point shall continue to rise until we either curb our emissions, or produce less oil. The former is the more likely option to be pursued by any government seeking re-election. What is equally as alarming is the direction of our emissions trend line. We are increasing at a drastic rate with no signs of slowing down (until 2030), largely due to our oil and gas sector and outdated energy generation methods. Almost all other provinces (with the exception of Saskatchewan) are trending in the right direction or very close to it. But Alberta has a lot of heavy industry, we must generate and use more energy than other provinces right? Alberta barely cracks the top 3. After analyzing data from Statistics Canada and far too many cups of coffee I came up with a telling representation of how Alberta ranks relative to other provinces based on Energy Generation by Fuel Type and Emissions from Energy Generation. The graph below shows data from 2015 for each province’s energy generation by fuel type. Quebec and Ontario generate over twice as much energy as Alberta yet produce far less emissions in doing so. The key difference – Quebec generates nearly 100% of its energy from Hydro, and Ontario generates nearly all from Hydro and Nuclear Energy. Alberta, represented by the rather striking brown line generates 90% of its energy from combustible fuels. The graph above does not break down combustion into coal or natural gas, but I think you get the point. Emissions from energy generation were calculated by using the average multipliers shown in the previous graph, Carbon Emissions by Fuel Type. Coal and natural gas were not differentiated in the Statistics Canada tables, so I used the calculated values from Energy Alberta (56% of combustible fuel is coal and 44% is natural gas based on 2015 values). Cross referencing this data with data from Alberta Energy, (2013 emissions = 267Mt, energy generation = 17% of emissions) the values are within reasonable error. The minor discrepancy can be attributed to differences in 2013 to 2015 emissions values as well as carbon intensity values which will have their own minor internal error. Why does Alberta generate 3x as many carbon emissions in order to produce half as much energy as similar provinces like Ontario and Quebec? The outdated practice of burning fossil fuels for energy. This information is quite a telling sign that the fossil fuel era must be phased out if we are to curb, manage (or even begin to reduce our acceleration) of carbon emissions. Not just coal, but all fossil fuels. This won’t happen overnight or likely within a decade or two but it must happen eventually. Reducing emissions from energy generation is just one piece of the pie. Emissions need to be fought through all sectors – oil and gas, transportation, construction, residential and forestry. Alberta solar power capacity is growing and will soon be enough to handle a significant portion of the energy demand. Although the solar energy industry is growing, there must be cooperation, collaboration and leadership throughout all industry sectors and governments.